Lake Michigan is finally frozen and it’s gonna be a while before we get back out on the water. 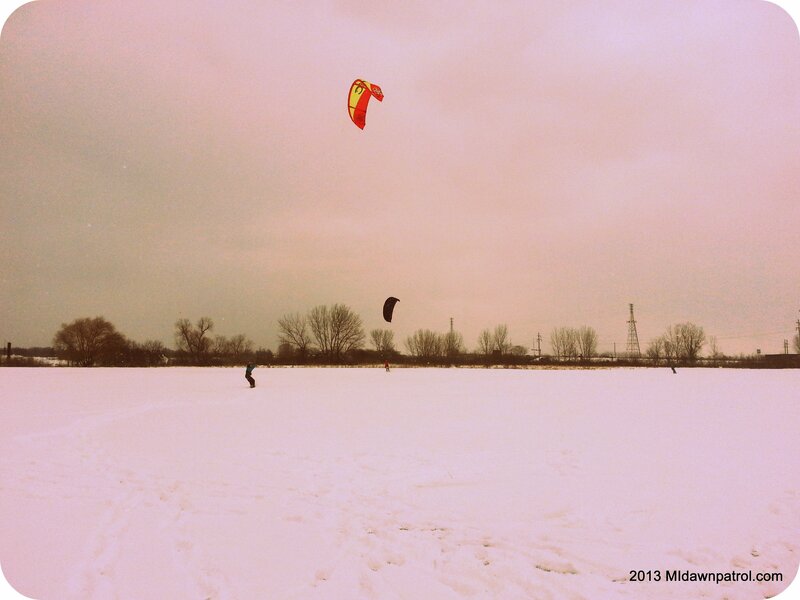 With all the snow and wind in the forecast for super bowl Sunday we decided to give snowkiting a try at Harbor Island in Grand Haven. According to NOAA there’s been anywhere from 16-21 inches of snowfall over the past 7 days. Jetty got to Harbor Island first and as I pulled up I saw he had blown up his 12 meter Cabrinha Convert. I helped him launch and then watched a few tacks. Jetty had no problems taking to snow kiting but he did note that the wind was pretty gusty. A couple other local kiters were out have a good time as well. I had only brought my 11 meter Switchblade so I had to run back home and grab my 15 meter Naish if I was to have any hopes of moving since I’ve got about 80 lbs on Jetty. By the time I got back to the field Jetty was finishing up. He was complaining about his legs burning and to be honest I thought he was being a bit of a crybaby 🙂 That is until I borrowed his kite and tried snowkiting for the first time myself. The wind was super gusty and I dropped the Convert at least a half dozen times. Maybe it was the gusty conditions but I found it more difficult to relaunch in the snow than in the water. After dropping the kite, the lines would have a lot of slack in them and in order to tighten them up I’d have to scoot backward with the snowboard strapped on to my feet. Not a big deal but definitely takes a little more energy. After having a lot of fun dropping the kite, doing the superman crash over the front of my board, and riding for a bit I had to stop because my quads were on fire! I can only hope that one gets used to the feeling after a while or some snowboard adjustments will help because my legs felt like I had been doing the human chair for a half hour. Harbor Island in Grand Haven is a fairly small field but is big enough for snowkiting and it’s hard to beat the location being so close to town. Not sure if it was the north west wind direction causing the gusty conditons here but I’ll definitely give it another try. Below is a short video of Jetty on his first few tacks.